Investigator 3 truly is the ultimate tool for the efficient and effective investigation of medium to high potential incidents. Use the powerful Investigator 3 software to plan and run your incident investigations seamlessly from the creation of the initial incident statement right up to the production of a standardised report and SMART recommendations. Investigator 3 is the only software tool to combine the three best practice incident investigation and analysis methods; the Kelvin TOP-SET incident investigation methodology, the Tripod Beta incident analysis methodology and the Root Cause Analysis (RCA or RCFA) method. Investigator 3 guides users through each stage of the investigation process and helps the user to unearth, document and share the real root causes of an incident. It is a great incident reporting tool. Investigator 3 follows the renowned TOP-SET incident investigation methodology to plan, structure and manage the entire incident investigation process. The TOP-SET method is straightforward and easy to use and produces high quality consistent results. By utilising the TOP-SET indicators - Technology, Organisation, People, Similar Events, Environment and Time - Investigator 3 uses a structured process to ensure ‘nothing is missed’ and that information gathered is relevant and of sufficient quality to allow effective incident analysis. 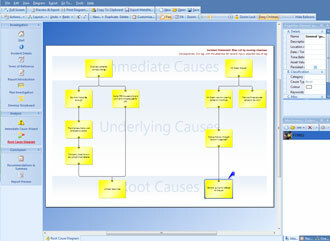 At the analysis stage users can select to carry out a Root Cause Analysis or a Tripod Analysis. Designed by Investigators for Investigators – Drawing on over 30 years of incident investigation knowledge and experience, Investigator 3 has been designed with the end-user in mind. Extremely user-friendly, with a logical work flow, Investigator 3 really does take some of the stress out of incident investigation. Speedy Diagram Building – A great time saver! The interactive storyboard is a powerful information gathering platform. 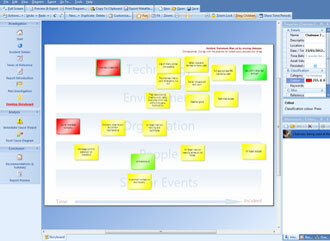 Structured under the TOP-SET indicators it allows users to create electronic “sticky notes” to capture text, images and other evidence in a highly visual and free-thinking manner which ultimately helps to build a full picture of the incident. Once created, the storyboard diagram is easily exportable. Creating electronic Root Cause Analysis and Tripod Diagrams has never been easier. The intuitive software helps the user to produce and export complex analysis diagrams with a few clicks of the mouse. SMART Actions and Recommendations– These can be easily created and linked to specific causes, helping to eliminate recurrence of incidents. Standardised Reporting – All users, even those with limited incident investigation experience, can now produce consistent incident reports to a professional standard with the help of Investigator 3. Fully exportable to Microsoft Word, these reports also include all analysis diagrams, images, evidence and storyboard diagrams. Enhanced Presentations – Present your investigation findings clearly and concisely using Investigator 3. Effortlessly, showcase your findings in a structured step by step manner. 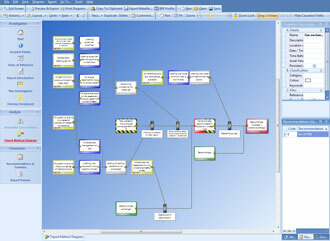 User-Friendly Design – Constant development and testing ensures that Investigator 3 is an uncomplicated software tool to use, even for less experienced computer users. The cost for one user licence of Investigator 3 is £2,599. To purchase the software or for information on discounts available for multiple purchases and corporate licences please contact us. Support and maintenance for your software can be purchased on an annual basis and entitles users to the latest version updates and 24 hour support for technical issues. It is also highly recommended that Investigator 3 users attend a Kelvin TOP-SET 3-Day Senior Investigator Course in order to enable them to understand the methodology and to use the software to its full potential.